A lot late in posting this - but we had a weekend trip, sans kiddo, to Baltimore, the last weekend of March: Friday to Sunday. We managed to cram in a lot of fun stuff in 2 1/2 days and 2 nights, with many visits to the many sights, museums, and restaurants that Bal'more has to offer. I've made a few photo collages highlighting the best of what we say, ate, drank and did, along with a video that seems to be working! We decided to go to Baltimore after a long story - a trip to San Francisco was a possibility but it got nixed. As we had a tentative list of sitters lined up for Nate, we decided on a weekend-getaway to someplace closer. New York, DC, Lancaster, all were on the list. Somehow, Baltimore felt right. Close enough with plenty to do but also very affordable and not too overwhelming options. In short, someplace different than home and navigable. First up - we stayed at a bed and breakfast called The Inn 2920, in the Canton neighborhood of Baltimore. I highly recommend this sumptuous place. It's only 5 rooms in a gorgeously renovated home that is spacious, private and way cool! The place is run by a couple, David and Warren. Beautifully appointed rooms and lounges/living rooms. You get fresh cookies, tea and treats every day, in addition to a home-cooked hot and lavish breakfast with coffee, tea and juices, each morning. 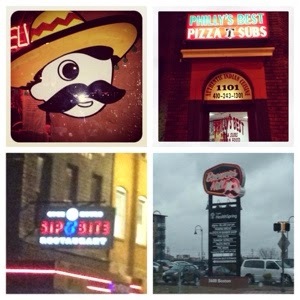 A few steps away from the hotel, was Canton Square, a four block area surrounding a small square park, filled with bars, restaurants, take out places, liquor store, coffee shops and the best place of all, Dangerously Delicious Pies. It was dangerous because the pies were delicious. We went twice, and tried to go a third time to the pie shop, but it was closed for the evening, which was good and bad (good for my waist, bad for my tastes!) Of the pies we ate, I had their apple pie twice. At first I was overwhelmed with the choices and thought I was being boring by choosing apple pie. To my thinking, if you can't do an apple pie right, you just shouldn't do pie at all! It's the most basic yet can be tricky to make well. It's not just about the crust, though that is most of it. DD's Pies have perfected crust AND the fillings. This apple pie was sweet, tart, deep in flavor and one of the best pies I've ever eaten. The apples almost tasted like they were caramelized first, like the apples from an apple tart tantin - firm w/a toothsome bite and a nice deep rich flavor. Liz tried a chocolate peanut butter pie, but it was too sweet for me. The filling was fudgy and brownie-like. 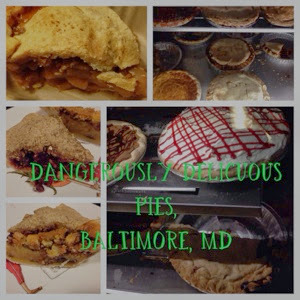 When we hit the road, we took another slice of apple pie, a tart cherry crumb pie (which was also dynamite) and their house specialty, The Baltimore Bomb. This pie is a classic "chess pie" filling, a thick custard-like filling that has pieces of Berger's Chocolate Chip cookies in the mix. We didn't know what Berger's cookies were, we'll have to find them on our next visit. The Baltimore Bomb was da bomb, but as with the chocolate peanut butter pie, a small taste was more than enough for me. We split these pies three ways, sharing some with our sitter when we got home. I liked the pies enough to take a drive down to Bawl'mer for a slice, on a whim! On Saturday, we went to see the American Visionary Art Museum. This was highly recommended to us by a lot of folks. 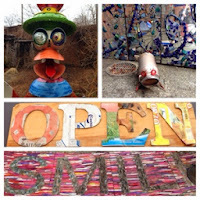 Since it's an "outsider" art museum, it appealed to my love of found art and street art. The place didn't disappoint. There were fun installations to see the moment we pulled up to the Federal Hill neighborhood where the museum is located. The museum houses art in two buildings; a main building with three floors of art, a restaurant, offices, and a spiral staircase, all brimming with art and whimsy. The second building, connected to the main building via an outdoor walk way and garden. The 2nd bldg is newer, and is sort of "barn-like". 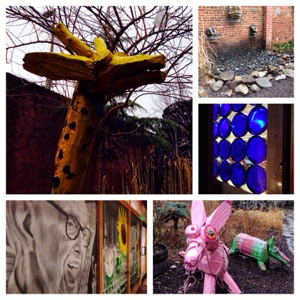 It houses spill-over exhibitions, Kinetic Derby Sculpture Bikes, and the art camp classrooms. I was giddy with the excitement of seeing so many wonderful and moving displays, reading the stories of the artists, and learning about the museum. We ate quite a few good meals and enjoyed a lot of great beer and wine. Two of our meals were in the hotel neighborhood of Canton. Stopped by Mamas on the Half Shell for lunch. Had take out from a kebab house for a late night meal on our first night in Baltimore. Saturday we found the famous Baltimore Sip and Bite for lunch (it was fine, as diner's go, but not blog worthy great like Diners Drive-Ins and Dives makes it out to be.) The waitress was sporting a ubiquitous wash, set and tease-out modified bee-hive, ala the Baltimore 'Doo. She could give a good dose of 'tude to any Philly waitress at Little Pete's, The Oregon, Penrose or Melrose diners for sure! Saturday night we met up with a friend who lives in the Hampden Neighborhood. 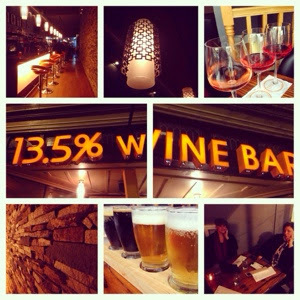 We went to 13.5% Wine Bar, and proceeded to stay there for hours, imbibing some the best beers and wine Liz and I have had in many years. We also indulged in a cheese selection, and house-made pizza. The decor, ambiance, service were top notch. It's the sort of laid back place with a soupcon of hipster coolness that I wish would come to Philly. We saw folks of all ages and back grounds - older, younger, different nationalities, all enjoying this causal bistro with a serious and unpretentious food and drink menu. Our server, Joseph, was funny and engaging, laughing and joking with us all night. We felt welcomed immediately and the place felt familiar all at once. The CHEERS Bar has nothing on this place as far as everyone knowing your name! 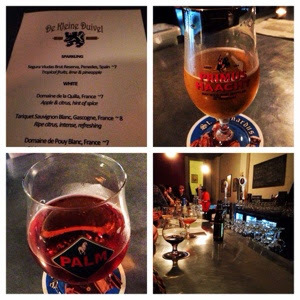 After our indulgent evening of fun, food, laughs, beers and wines, we went for a night cap to a newly opened Belgian Beer Hall, around the corner from 13.5% Wine Bar - De Kleine Duvel. It appears to be a former VFW Hall, with a huge selection of bottle and draft Belgian and Belgian-style beers. For the non-beer drinker, there is a nice liquor selection at the bar too. Bullit Bourbon and a Beer seem to be the choice drinks in this town. We enjoyed the beers so much, we had two - a Primus Haacht and a Palm. I'll have to put these two on my radar in beer crazy Philadelphia. Naturally, the next morning, I awoke with a bit of a hang-over...small price to pay for a great night of carousing. Baltimore lives up to it's moniker, Charm City. I know that there are many places not as charming as the spots we visited. Like my town of Philadelphia, there's a darker seedy side all around. The upside of Baltimore is that there seems to be a genuine care to reinventing itself as the city's best version of what it once was and what it can become. It's been 10 years since I was last in Baltimore. This visit showed me how much has changed. I saw so many improvements in areas that I used to know. I also saw places, buildings, and whole swaths of newly created neighborhoods that never before existed. I liked the variety of neighborhoods, the accessibility of each area. I liked that there is a "realness" remaining in the areas. There are lots of old bars alongside newer incarnations and revamped versions of old corner tap rooms. Each neighbor hood that we visited seems to wear its old clothes proudly while sporting some new architectural garb. I'm sure that all this gentrification has caused tensions, forcing those without means to feel as though they now have even less of a say in the changes of their neighborhood. With progress changes comes the problems of resentment. We've always lived this way; we've always lived in this neighborhood. It's a problem I know all too well having lived in Philadelphia, specifically South Philadelphia for over 44 years. I see it in New Jersey now too. Here's to hoping that Bal'more will continue to flourish, proving many more great sight-seeing adventures for all of us. looks like a great time, I often miss living there even though I love Philly much more as a city. 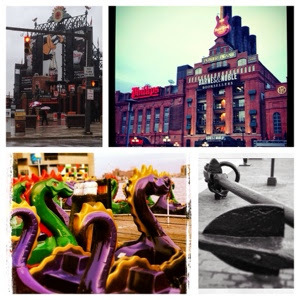 Baltimore has a special "charm" that can't be copied elsewhere.